Is your child ‘spirited’? Even if they aren’t spirited all the time, do they have spirited moments? You know exactly what to do in those moments, right? Well then we have a treat for you today. 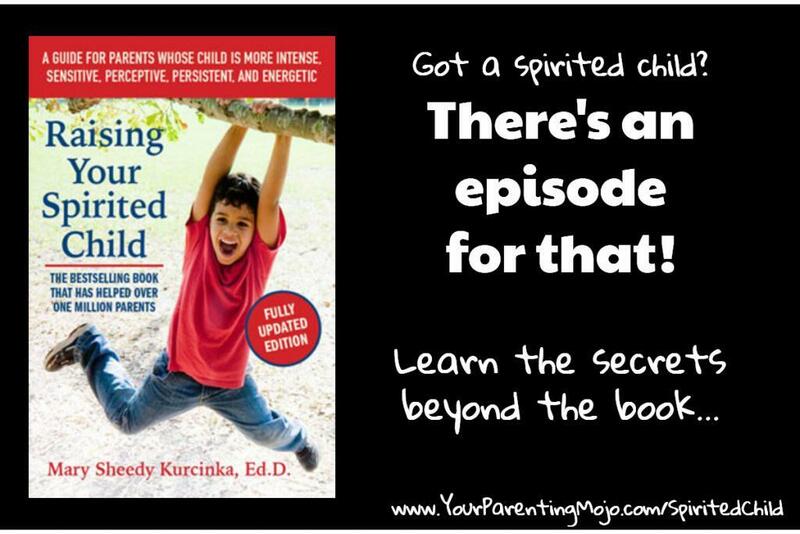 Dr. Mary Sheedy Kurcinka, author of Raising Your Spirited Child, walks us through the ins and outs of her book on the same topic. Best yet, we do the interview as a consult with a parent, Kathryn, who has read and loved the book, but struggled with implementing the ideas. Warning: we spend quite a bit of time brainstorming very specific problems that Kathryn is having with her daughter. You may not be having exactly the same problem with your child, but the brainstorming method we use is one you can do with a friend – take the approach with you to address your own problems, rather than the specific ideas. Read more about Dr. Mary’s books and other work on her website. Jen: 01:26 So Dr. Mary has a bachelor’s in early childhood education, a Master’s in family social science, and a doctorate in education. She has written four books on various aspects of raising children, which have been translated into 23 languages. Her son and daughter are now fully fledged adults and she lives with her husband in Bozeman, Montana. Welcome Dr. Mary. Jen: 01:48 And so when I mentioned in my fortnightly newsletter, which you can actually receive by subscribing to the show YourParentingMojo.com, that I was looking for a coat interviewer to help me interview Dr Mary and really dig into the ways to apply the wisdom in the book. I received a number of responses, but one really stuck out. Kathryn is based in London and she has a four year old daughter who we’re going to call Jane in this episode and a son who’s a little over a year old and we’re going to call him George. Jen: 02:14 I asked Kathryn to help us with this interview because she’d actually read and love the book, but had been struggling with the application of some of the strategies. She’s tried hard to support her spirited daughter as she grows and develops, but has found a particularly challenged in some areas since the birth of her son. So we’re here today to really get into the book, but also go beyond the book and get the real lowdown on how to implement the strategies in the book when the first attempt has maybe been a little bit less than successful. Welcome Kathryn. Jen: 02:42 All right. So Kathryn, let’s start with you. I wonder if you could please describe your daughter and how she fits into your family dynamic and I know you’ve read the book so you know that the words that are used to describe spirited children are very important. So what words do you use to describe her and what words do people around you who might not have read the book use? Kathryn: 03:01 So after reading the book, I would say that in particular it was the intense and persistent elements that really struck a chord, but also she’s sensitive, very perceptive, a very high energy introvert, I would say. And just very articulate about what she wants, funny, enthusiastic, that kind of thing. And in terms of other peoples, there’s never been so much the label’s put on her I would find, but it’s just kind of when people talk, when they’d see something happening, you know, as if, oh, so and so that I know that they’re spoiled and oh well people don’t treat me like King Tut, or you know, just, it’s more in people’s tone. And I, I noticed as well since her brother was born that it’s more she falls into a particular persona kind of in contrast as the main older sibling almost. Jen: 03:54 Is that pretty common? Dr. Kurcinka? Dr. Mary: 03:57 As the mean older sibling? Well, certainly one of the things we know about spirited children is their intent. So every emotion is intense, including jealousy, they’re also slow to adapt. So a shift in the family dynamic is certainly going to affect them, but they’re also incredibly perceptive of the stress levels within our family and so often it’s the spirited child who I refer to them as our stress barometers because they’ll often start acting out because they’re taking in the stress around them. And obviously a new baby brings a great deal of stress to a family dynamic. Jen: 04:42 Yeah. Do you feel as though that’s really impacted your family dynamic, Kathryn? Kathryn: 04:46 Yes, I would say that has made a huge difference because I think, you know, when people talk about age two and age for as being particularly noteworthy in our family, it was really age three. But I think that’s because that was, you know, in the leadup my pregnancy and then the birth of her, her brother, the starting of preschool. So many things kind of happened at that period of time and therefore also our resources were that much less to kind of cope with it. And whereas I had kind of taken everything on with her, largely myself, because I stayed at home, I didn’t go back to work after my maternity leave and had kind of tried to protect her a little bit there because she had very distinct needs as far as I could see it in terms of being a little bit more sensitive to stimulation and to situations and things I had kept her under my wing a little bit in that respect. Whereas I couldn’t obviously do that with a newborn and also just adjusting to letting go a little bit in terms of preschool, you know, and no longer being her whole world anymore. That kind of rattled things a little bit and of course changed the family dynamic quite a bit and then adding an extra person. Jen: 05:58 And these are all fairly natural things to happen, right? Brothers and sisters are born and their children tend to go up to some kind of care or preschool or something. Dr. Mary, how can we help children and prepare them for the kinds of transitions that Jane’s been going through? Dr. Mary: 06:15 Well, there’s several things. One is, as you said, with the starting preschool, there’s also a change in routine in one of the things I talk about and work with families on in my private consultants, there’s two aspects to effective discipline, there’s structure, which is the routine, the rules, the expectations, they’re the things that remain pretty stable and then there’s the emotion coaching and the challenge with a new baby and starting preschool is the structure gets disrupted and so if you think about it’s kind of like all of a sudden moving or changing jobs or changing bosses at work that all of a sudden there are…what you expected in the past is no longer occurring. Things are different, so in preparing them, one is reforming that structure and creating predictability for them, which will then reduce the frequency and intensity of the meltdowns, leaving you the patience and energy to do the emotion coaching when it needs to be done. Jen: 07:25 Yeah, Dr. Mary, you just said something really profound there that helped me to understand the gravity of these kinds of changes in a child’s world. When you talk about being comparable to moving for an adult or changing a boss for an adult, you know, I think if there was a big deal, I need to figure out what a new boss wants for me and how I interact with that person and you know, even as something as simple as changing a child’s teacher at preschool, you might think, well all the other teachers are still there and all the other children is still there, but that’s a very different interaction and it makes me feel as though, oh yeah, I can understand that. I can understand why that would be difficult for a child. Does that help us to bring more compassion to it, do you think? Dr. Mary: 08:02 Well, I think it is important to look at that and look at this situation, yes, very compassionately. And that’s another thing that we can do is actually reduced expectations on that older child, which can be hard because it’s like, okay, now you’re the older one and I need to be taking care of the baby. But one of the stress reactions you’ll see is shut down. And shut down behaviors are, I can’t dress myself, I can’t walk, I can’t feed myself, and the natural reaction to those responses are you could do it yesterday or you could do it an hour ago and we push to have them do what they’re capable of doing, but what they’re actually telling us is I’m so overwhelmed, I’m shutting down. And so one thing that we can do as a parent is proactively say to them before they’re demanding, carry me, dress me, feed me, is, “is today a day that you can dress yourself or do you need help?” And if they say I need help, we help them because we recognize, wow, they’re dealing with a lot of stuff here. And so instead of fighting and struggling, we help them, but we also nudge them by saying, okay, you know, today I’ll help you, but pretty soon maybe even tomorrow you’re going to surprise me and do it yourself again. So we let them know we’re not doing this for ever, but we can see that right now, you need a little extra support. Dr. Mary: 10:54 And you’re absolutely right, Kathryn, you know, as a mom who are very protective of our children. It’s kind of the mother bear syndrome and one of the things I think that’s important to recognize, especially with a four year old, four year old and many spirited children, tend to be very bright and have excellent language skills and so we often assume that they have an understanding of things that they don’t because they are so verbal and so when we see behaviors that are potentially dangerous to the baby or a safety issue for the baby, the question becomes what is Jane feeling and needing in this situation? So is it an issue that she actually doesn’t realize, you can’t hug a baby that firmly. And so it’s teaching her how to hold and touch the baby. Is she feeling jealous? So instead of pushing the baby, teaching her to say I want him to go away, and that when she uses the words, we actually at that…because we’re teaching the words at this point, set the baby down and hold her because she used words instead of action. So it’s in those situations stopping to think what is she feeling or needing. Is it a skill issue? Is it a feeling she doesn’t know how to express appropriately. But as a four year old she has no idea that she can harm the baby. Jen: 12:39 Wow. I would never have thought that. Wouldn’t you think that if you hit something it might hurt. But no, that’s a very profound realization I think to understand that a four year old can’t think that. Kathryn: 12:51 And I think sometimes if there are kind of two elements to it and like for, it’s the intensity piece around just that kind of out of control, excitement/anxiety, kind of that, you know, in the beginning in particular, if I’m trying to spend time just one on one with her to have a little bit of that, she actually would reject that for quite awhile. And she always wanted to know where he was and oh, if he was asleep she wants to be there waking up. Like she just really didn’t want to take her eyes off him. Like really was affectionate to like overzealously affectionate, but you know, in a way you would expect. But just couldn’t. It was like, yeah, simultaneously just out of control, affection and anxiety around the situation that she just couldn’t quite get to grips with, it felt like. Dr. Mary: 13:42 And, and I think that’s an interesting choice of words when you say kind of anxiety about it. And again with the energy and that frenzied energy, we look at the fuel source because that frenzied energy is saying she’s overstimulated, she’s over aroused. And so one question I would have is actually about sleep because if the meltdowns are happening like after school or late in the afternoon or that frenzied behavior, that actually is an indication that can be an indication of, oh, we’re tired. So what time does she wake in the morning? Kathryn: 14:25 She wakes up about 7:00 usually. Dr. Mary: 14:27 And is she napping? Kathryn: 14:29 No, and she can’t now because she’s in school. Dr. Mary: 14:33 Okay. And what time does she fall asleep at night? Kathryn: 14:39 Uh, she’ll be actually asleep by about 8:30. Dr. Mary: 14:43 Okay. So if we look at the averages and these are only averages, which means some children will have more, some people less. But this time of the year, the winter, when the nights are long, we actually need more sleep than we do in spring and summer. And for a four year old, the average is right around 12 hours. And especially this time of the year, it’s usually a solid 12 hours. So my question to you is what is she like about 6:30, 7:00 at night? Kathryn: 15:16 Yeah. That can be a bit of a difficult time. That’s the window of time as I’m kind of taking her brother up to sleep and yeah, it just depends. That was part of my reason for recently bringing dinnertime forward is because sometimes if we were still eating at that time it would get a bit hectic. So now I’m trying to do it a little bit earlier, but we have had a lot of tweaking with her sleep because that has always been a difficult issue for her. And then when she was napping we couldn’t get her to fall asleep often til like 9:30, 10:00 at night. So we had a really a hard battle when she was dropping the nap because to not have it didn’t seem enough but to have it team too much and we couldn’t quite get it. This has been kind of the most solid in recent times that we’ve had it, that we’re in more of a pattern and she’ll only nap on the weekend, on a rare occasion that we’re in the car or something, but she’s never fallen asleep easily. So it’s the, any routines and things that we have are pretty hard. One, because she, uh, for awhile was falling asleep a little bit earlier, but then it just kinda creeps creeping back and back. So we, we haven’t been able to get it earlier than 8:30. Dr. Mary: 16:33 One of the challenges when you have a child that wakes early in the morning is the odds are very high that she’s genetically wired as a morning lark. So morning larks wake early in the morning no matter what time they go to sleep at night. So my first recommendation to you would actually be to look at her day because a good night’s sleep begins in the morning. So she has a 7:00 AM wake up. It would be, you know, wake up dressed, toilet. And I always have kids do that before they leave the bedroom area so that we’re not surprising them. Some days we dress, some days we don’t dress in it. So then it turns into a struggle in the morning. So we dress and then come for breakfast. And then throughout the day I used to work of Ellyn Satter who recommends six mini meals a day. So every two and a half, three hours. So breakfast is at 7:30, then at 9:30, 10-ish. We have a mini meal in the morning, but again each meal is a little protein, little carbohydrate, little fruit and vegetable, a little fat. So it’s a complete mini-eal. Lunch would be 12, 1230 ish. Another snack about mini meals in the afternoon about 3:00, dinner probably 5:30. And then for her I would probably go right from dinner into prep for sleep so that her head’s on the pillow and the sleep routine is completely finished by 7:00 PM. Jen: 18:18 How might that fit with your lifestyle, Kathryn? Kathryn: 18:22 That would be a challenge because my husband gets home at 6:30 and my son goes to bed in that window of time and he takes a while these days too. Jen: 18:32 So what would you recommend Dr Mary, for people who have more than one child and it’s difficult to get home from work or whatever. You’re doing a lot of a lot of working parents who are probably listening to this and you have to get dinner on the table that you have to get the baby fed, get the baby to bed, get the older child bathed. How can you get all that done by 7:00? Dr. Mary: 18:51 So a couple of things. One would be if dad is coming in at 6:30. Are you breastfeeding the baby? Kathryn: 19:00 I am, yeah. He’s having dinner properly now too. But before bed I do breastfeed him. Dr. Mary: 19:05 Okay. So you know, if dad would come in and actually would he be open to participating in the bedtime routine for either that the baby has been breastfed and then he finishes with the baby and you finish with Jane and then you have a meal together at seven with both kids down. So that would be one way. Otherwise we look at putting a nap back in, but it sounds like Jane goes to preschool in the afternoon. Kathryn: 19:37 She goes to school, they call it “reception” in the UK, it’s like kindergarten but she started school. So she does whole days at school. Dr. Mary: 19:44 And they don’t nap? Kathryn: 19:48 No they don’t, no. Dr. Mary: 19:48 Okay. We have to get naps back into preschool. I think an important thing is recognizing that right now we’re asking Jane to adapt to the needs of others and she can’t do it and so we have to look at…like, the baby naps. Can we potentially…we might look at shifting the baby’s naps a little bit so he can go down 30 minutes later or you do the routine with both of them. Many people with multiple children go through all the steps of the routine with all the children and then stage it who needs to go first for the last good night and who’s second, who’s third, et cetera and is it feasible to move their meal so that it is closer to a 5:30 meal for them and then you and your husband eat later or he eats later? Kathryn: 20:51 That part is fine. That’s. We’ve already started doing actually since my husband has switched jobs and is now getting home later than he used to be. We started eating myself and the kids at 5:30, so that part is fine. Dr. Mary: 21:05 What are the steps of Jane’s sleep routine? Do you bathe her then or what? Kathryn: 21:11 Usually not at nighttime because I think it mentioned in your book that that can be stimulating for some children and for her that was definitely the case. We had real trouble getting in and out and it really dragged things out a lot so she has that in the morning unless it really needed to be at night and so when we go upstairs it will be just mostly brushing her teeth or going to the bathroom and putting her pajamas on and then she does have bedtime stories. Then the two books that she has from school and then sometimes a couple others depending how long they are, but the story time hasn’t been an issue with transition, so we’ve kept that part at the time. That seems to work well. Dr. Mary: 21:55 One of the things, as you talk about the number of books there could be started right after dinner so that say at 6:30 you go up, brush teeth, do the toileting pajamas and we’re down to one book for her and so the baby could be part of that or you could read while you’re nursing? Kathryn: 22:24 She does like the idea of reading with her brother there. He’s wandering all over the place, but she does like having him in the room to read so we could do that. I think a part of them was the couple of them being the school books I’d found that was most part where she’d be more willing to practice the reading a little bit, as opposed to afterschool when I would have ideally had liked to do it. She doesn’t seem to be quite in the frame of mind. So when things are calm without the distractions in the, in the dark, just with the little flashlight kind of thing. We’ve just been having some good success with that lately. But we could try again with moving that to right after school perhaps or playing with that window a bit. Dr. Mary: 23:03 Well and after school, as an introvert, she… You were absolutely correct. And recognizing she needs downtime. She’s been socializing all day. She’s been with people and she’s tired and you know, tired physically, but also drained as an introvert. So when she comes home I would again plan that transition home that she gets downtime, gets her… What time do you pick her up? Kathryn: 23:34 About 3:30. We walk home, which, you know, it’s only 4:00 when we get home, even though we live five minutes from the school then we have a bit of an adventure on the way back. Dr. Mary: 23:47 Okay. And has she had an afternoon snack when you pick her up? Kathryn: 23:52 She does. They have afternoon fruit in the school. You bring your own fruit and they have that at some point in the afternoon, but she is always starving so I do always have something in my pocket for her to eat on the way home. Dr. Mary: 24:04 Right. And one of the things I would think about is, you know, bringing a carriage or a stroller of some type so that she can climb in if she doesn’t want to walk or she’s tired, but then she could actually have her snack and just kind of some downtime in the stroller. Does she like to be in the carriage or does she want to walk? Kathryn: 24:29 Well, her brother’s in the buggy, in the carriage, but we have a buggy board they call it that she can stand on quite. She quite likes to do that. But if some of her friends are like that, live around us are walking at same time, then she likes to run off with them quite often, but it all just depends if it’s just us and absolutely she wants to stand on the board. Kathryn: 24:59 I think she’s over the weight limit for it now. Jen: 25:04 What if the baby was in the backpack? I think that’s what Dr Mary was saying. Kathryn: 25:09 Uh, yes. No, I mean I think she’s over the weight limit for a buggy itself. Jen: 25:13 Oh, your daughter is. Kathryn: 25:14 She’s a bit tall for it yet. Kathryn: 25:17 Yeah, I’d be a bit conscious of messing with that one because she was jealous about it for a little while as well and we’re past that stage now. Dr. Mary: 25:24 So what about when you pick her up at this school, is there a place that you could sit and let her have some protein and something to eat and then begin the walk home? Kathryn: 25:38 Not really because they want to shoo us out of the school gates within a window of time. I think she at first gets quite distracted by the other kids that are there. Like if our neighbor is still there, she’s quite wants to find him and ideally walk with him and then on the way then like when she’s standing on the board, she’ll, she’ll eat her cereal bar, whatever it is or banana or something and then when she’s finished that then she’ll run after him quite often. Dr. Mary: 26:05 Okay. Well, one of the things I would just make sure that, the snack that you bring for her can includes protein because otherwise what happens then is you get home and not only is fatigued from her day, but we’ve got a blood sugar drop because she hasn’t had her protein and she’s hungry and then that sets up the rest of the afternoon for her. So when you come in the door, what happens once you get home? Dr. Mary: 27:10 Would she come home and go into the bathtub? Kathryn: 27:14 When I’ve suggested it before, she never wants to see, she finds it calming. That was actually a kind of a stand-out question for me is that she likes a lot of the calming things, but she really resists them. So like if I suggest the bath then she really doesn’t want to go into the bath or if I put calming music on then she said this, this is sad music, happy music and she wants something really lively and some of them…even the things that she does really enjoy, like with her sticker book and Play Doh and things like that, that she can get really engrossed in if it’s put to her when she’s feeling kind of revved up, then she doesn’t want to or does only for few seconds kind of thing but won’t let herself be calmed by it kind of thing. Dr. Mary: 27:58 So one of the things I would suggest, because this transition is proving to be a pretty challenging one, is I would create a ritual of pickup and entry that is the same every single day. So it isn’t, do you want a bath today or do you want Play Doh today? But in fact, mommy picks you up. We have the snack, we get on the board, we have this snack. Once we’ve had the snack, then we can play with others if we want to. On the way home. We’d come in the door, she goes into the tub if she’s needs, you know, if that was an incomplete snack, we can have some snacks in the bathtub while she lounges or we just go into the tub, you know, and you sit there. The baby is, they’re not in the tub, but he’s there and obviously we have the bathroom so that it’s okay for him to be wandering there. But we let her have that downtime. If a bath doesn’t work, we might use audio books. The other would be is that we always do Play Doh or water play if we’re not going into the tub. But I would create a ritual that there are decisions to be made that in fact we, if it’s Monday, Wednesday, Friday, we always have this same snack. Tuesday, Thursdays we always have that snack number two. And when we come in the door, we do the same things because at this point she can’t make decisions. Jen: 29:38 And that’s not to say the routine couldn’t change when needs change, but that it could be helpful right now. Is that right? Kathryn: 29:47 Yes, I think that’s quite true actually, because if it’s a routine to have that bath every day, then I can see that she’d probably become less resistant to it if it’s always at that time. Dr. Mary: 29:59 And when you have a persistent child, the underlying structure and routine is so important because if we surprise them, then we trigger the arousal system and if they’re already drained and we ask them to make decisions, again, that becomes for the introvert who needs to process decisions, again, that’s arousing. And so my tendency is to suggest just very simplistic routines that for the most part stay the same each day. And if you know, if there’s a play date or something, well actually… If she’s been in school all day, I wouldn’t do play dates late afternoon. She’s as an introvert, she’s had enough. But if there’s a doctor’s appointment or something we have to go to, then we prepare her for that, but the rest of the time the days are the same. So she knows what to expect. Kathryn: 31:04 And I think I saw the suggestion of visual charts as well, Dr Mary in your book. Dr. Mary: 31:09 Absolutely. And those visual charts can be very simple. I will take a piece of copy paper draw like a four to six frame on it, like a cartoon frame and then have the kids actually draw because I am completely artistically challenged and you know, you can do photos, you can download drawings from the internet and certainly make it nicer. But the bottom line is you don’t have to. And so I just let the kids draw one step. So it would be mommy comes to school, we have our snack, we get on the board, we walk home, we take off our coats, put away our coat and our shoes, we go into the tub, we play in the tub, you know. Then maybe we have reading time. That might be. Then she might be ready at that point to do her school books because she’s had some downtime. I might experiment with that. And then we have dinner by 5:30 ish and again maybe a little reading, a little low key play and 6:30. It’s maybe a bedtime snack. So if daddy comes in the door we have just a little bedtime snack and then it’s toileting teeth, pajamas, one story, kiss, hug, head on the pillow at seven. Kathryn: 32:37 All right. And so I want to just kind of bring this back up a level because we’ve been talking about Kathryn’s very specific situation for quite a while and I think what’s important for parents to take out of this is not, well my daughter doesn’t have a meltdown when she gets home from school. How is this relevant to me? But the idea of looking at whatever situation it is that you’re struggling with and brainstorming it and I mean… How many alternatives if we just generate that could potentially shift this routine to get Jane some more sleep. And I, you know, we just thought of this in 10 or 15 minutes. So I think Dr. Mary does actually do consults, so that’s one way of doing it, but maybe resistors could also just call a friend and describe what the situation is and together you could brainstorm different ways that you could adjust the routine to make it better fit your family. Dr. Mary: 33:27 That’s a great summation and you know, we have a struggle that we can predict happens every day. Then let’s plan that for success; let’s plan that transition, that’s look at what’s working, what’s not working, and I know Kathryn, you’ve been playing with different options, trying to find things that work and recognizing that and that’s a really good thing. So part of it’s knowing our child. We have an introvert, which is interesting because she recharges as an introvert, but she’s also very social and so she has that mix of “I want to be with my friends, but oh, this is all very exhausting.” And so she’s got that push and pull going on and so we know who we’re working with and then the need for routine and predictability because that’s very calming to children and then protecting the sleep. Because when we have frequent meltdowns, when we have issues with impulse control, the first thing I’m always going to look at is the sleep and the structure because without enough sleep you can’t manage emotions and you can’t control impulses. Jen: 34:43 Yeah. And so the other thing that was really clear to me as we’re talking through this is the idea that we’re not trying to fix Jane, we’re not trying to fix a spirited child. We’re looking at the whole family dynamic and how the family works together as a unit. And so I’m wondering if we can spend a little bit of time talking about you, Kathryn, and what you bring to this interaction. So could you tell us a little bit about your temperament and how this either helps or hurts or maybe both your interactions with your daughter? Kathryn: 35:12 Sure. So I think I’m quite similar to her actually. Dr. Mary: 35:18 I think, well it can be helpful in terms of empathizing. So looking at the words themselves, I suppose the intense, persistent, negative first reaction, sensitivity to noise and emotion, perceptiveness, slow to adapt. Jen: 35:33 And these are all words from the book, right? Dr. Mary: 35:35 Yes. Yeah, yeah. Those all resonate with me as well and so like intensity not I hadn’t noticed as much, but as a child, yes, but you know, in my interactions with her, I hadn’t noticed so much until, as I mentioned, you know, as she was around three-ish that I could feel that element of my personality more so, which is counterproductive in that case. The persistence I think was quite useful and is quite useful I suppose, in sticking to my guns when I know that she needs something and that kind of goes against what other people might find convenient at that moment, you know, so obviously if we’re going to visit family or going to different functions and then that would potentially be interfering with nap times and things like that. That’s something that I’ve really stuck to and just sticking with what works for us, you know, even if that’s parenting her differently than the next person kind of thing, I think have always been willing to be an advocate for her, which she kind of has needed, I felt. Kathryn: 36:38 Negative first reaction, that kind of thing, that that can be difficult. Of course when they, if they want to get out all the messy things or you have to be conscious that no, okay, no, that probably isn’t as bad as that idea is that feels right now. And I suppose too like with her suggestions, just the, if something might be slightly inconvenient to just keep that in check, I suppose that to make sure that she was getting all the opportunities to explore her own curiosities and things as a toddler than that was, became more relevant and with a sensitivity, with noise and stuff, obviously if, when she’s had intense reactions is the picture of a supreme, for example. It’s something that I haven’t really found hard to keep calm over with that. That’s been a growth point for me, to try to breathe through that. Jen: 37:29 Love it! Dr Mary, I imagine that Kathryn is not alone in feeling that intense feeling when a young child screams? Dr. Mary: 37:43 Absolutely not. And there’s you talk about that you’re very similar to your daughter and as you said, the asset of that, as you can really empathize with her, the challenge is the same things that are triggering her are triggering you. So if you think about the pickup at school and anyone who’s picking up children at school knows it’s chaotic, it’s noisy, there’s people, there’s cars, there’s all of these things happening and things are coming at you from all different directions. And so as you think about that for yourself, it’s a challenging situation for you on a sensory level and also on an adaptability level of kind of knowing what to expect. And so the part of having that kind of ritual of what you do despite what’s going on around you, you may actually find calming for you as well as for Jane and while I’m all for walking and I absolutely love walking and live so I can walk, but I almost wonder in this situation, do you have access to a car? Kathryn: 38:57 We do, but where I would have to park would be just about as far as where we live. Jen: 39:04 Since you’re in in London. Dr. Mary: 39:06 Yeah. Okay. Is that, you know, my thought would be is if you could pick her up, get her in the car, drive away, be home in five minutes and go out later for a walk. Again, that might be an alternative, but it sounds like it’s not in this situation. And Jen as you, as you said, I think the important thing, and I always say this again in the consult is whatever recommendations we come up with, it has to work for your family and your situation. So it is addressing what do we need to make this transition calming for everyone that works in our situation. And the answer to that…there’s 10 different answers to that and the answers may vary between families as well. Jen: 39:57 Yeah, for sure. And so we were talking a bit about the screaming and I’m wondering because I really think this is not unique. I wonder Kathryn, if you can maybe describe a recent example of something that triggered you and maybe it was a screaming, maybe it was something else that is even more triggering to you than that. And can we just kinda talk through that and what are the strategies you could try in the future? Kathryn: 40:19 So I suppose the screaming, I mean that’s been something that has started right from infancy that she’s just always had a very strong frustrated reaction since very early but also like then as she got older with disappointments and, and so forth, or to interrupt with a scream that because it’s so triggering, find a don’t respond as well as I would like to. So I do try to reframe the emotion or you know, oh I can see you’re trying to do this and this is frustrating and so forth. As it continues, I hear that you don’t need to scream and scream. You don’t need to scream and scream and you think, oh, I don’t know how much am I sounding like I’m trying to suppress the emotion. Like is at four, is that still like crying? Is that still something that she’s doing right by expressing that or I suppose I’m not sure that I’m talking to her about that in the right way to teach her that to scream because she’s angry or screaming because she’s frustrated isn’t socially appropriate, but versus, oh well she’s four and also an adult doesn’t cry at everything, but it’s fine for a four year old to be crying over things like that in the wider range of contexts. And so yeah, that has been a bit of a struggle for me to kind of figure out in the moment how best to respond to that. Dr. Mary: 41:47 Well, again, we always have to look at what’s behind the scream. So let’s take for example, frustration. So she screams when she gets frustrated and one of the things we know as an adult is there’s times we’d like to scream when we’re frustrated. For the most part, we have learned other strategies we’ve learned to ask for help, to step away, to take a break, to take a deep breath. And for a four year old we can very… What I would do is like if there’s a toy that she plays with that frequently frustrates her or her brother is getting in her space, which we didn’t talk about that earlier, but there are kind of key times where sibling issues increase and one of them is when the baby starts getting into the older child space, it’s very upsetting to them. So the bottom line is when she’s calm is you say to her, you know what you’re feeling, so you do a redo, and a redo helps her understand what she was feeling. Dr. Mary: 42:57 So you were playing with the magnetic blocks and they collapsed or you’re using the crayon and your brother grabbed it. What that’s called is frustration and when we’re frustrated the next time you’re frustrated, I want you to say help and I will come and help you. So we don’t even need to say “you don’t need to scream.” I mean you could say that, but some of the spirit of kids, if you kind of review the mistake, then they just get upset again. So we just say when it’s called frustration, when you get frustrated, you can yell help. And I will come and help you, let’s try that. And you actually role play with them. The situation, like you pretend that she’s coloring and then you take the crayon like the brother would and then you have her practice saying help. And if she says, I don’t want to say it, you can say to her, would you like to listen while I say it so then you say it and then remind her that next time, that’s what you expect her to say. And so we get to a situation, she starts to scream, now we can say, Jane, remember what do we say? Help and I will help you. But the teaching has to be afterward when she’s called. It can’t be in the heat of that moment. Kathryn: 44:29 Yes. I think that’s probably where I’m going wrong. I think when I’m following it up to, I think I’m not waiting long enough. Dr. Mary: 44:36 Which is another thing is teaching kids what it means to be calm. And in Raising Your Spirited Child. I also talk about having calming baskets. So if you know that going out the door, sometimes it’s upsetting for your child and you’re trying to take care of the baby, get the baby ready and she starts to fall apart about her coat is you have right at the door, a calming basket and the basket. She’s helped you select lovies, stuffed animals, books, you know, something that she enjoys and you say to her, you know, go to your soothing, calming basket. I need to take care of the baby. I will come back and help you. And so it’s right there. And so it’s not a punishment, it’s not isolating her. It’s here; take a break, get your stuffed animal, get your lovey and I will come back as soon as I can. And then we teach them that they stay at that calming basket until their voice is quiet. Their limbs are still, their jaw is relaxed. That’s a calm body. And if we’re not calm yet, we stay at our calming basket. Jen: 45:54 And should Kathryn be with Jane there at the calming basket so that it feels more inclusive and like a time in rather than like a time out? Jen: 46:14 But you are right there. Dr. Mary: 46:15 You are right there. Jen: 46:16 Okay. Yeah. Okay. Dr. Mary: 46:18 And you can have one in the kitchen. You can have one in the bathroom, you can have one in the bedroom, you can have 10 of them in your house so that it’s not isolating they’re right there where you need them. Okay. Kathryn: 46:32 I suppose it provides a bit of a visual reminder as well. I think sometimes where if I’ve suggested an activity with the purpose of it being calming, there’s kind of push back against it, but if she stumbles across something on her own then has more of an interest in it, so to have things that she could spot all over the place is possibly a good idea there. Dr. Mary: 47:02 Kathryn. As you said too, it’s kind of the messy things can sometimes be a trigger for you of like, I can’t deal with this right now. You also can establish in your day at a time for messy toys like you know, mornings are good for us to do that or Saturday, these are good to do for us and otherwise it’s not time for those because it… Like if you’re trying to get dinner and she’s doing something messy and the baby’s trying to get in it, now everybody’s stress level goes up instead of being a positive. This is actually fueling the situation so you can establish again, predictable, messy activity times. So both you and Jane know when to expect them. Kathryn: 47:54 Yes. That’s a good point. Jen: 47:56 Great. Well I know we’re almost out of time here. I think we could probably talk for another three hours about this. Kathryn, is there one more burning question that you just have to ask before we wrap up? Kathryn: 48:07 I suppose the one and only thing in terms of limits that has just always been a curiosity for me is that I’ve always in a meltdown situation, I’ve never wanted to leave her with the meltdown and so when that’s happened at bedtime, if it’s I’ll stay with you as long as you’re lying down and quietly kind of thing. If my leaving, if she got up kind of thing, would then trigger a meltdown and I don’t want to leave her in the meltdown. Is there a suggestion around how to handle that kind of a scenario? Dr. Mary: 48:42 Well, two things I would say first is if we’re having regular meltdowns at bedtime, we’re putting her to bed at the wrong time and probably too late, so on a proactive basis I would be tweaking the bedtime routine and probably moving it earlier. If this is an unusual thing. So the routine has been going well and all of a sudden tonight she suddenly is losing it, then that’s the great thing about an effective routine is now you know that something’s up. You know, she’s coming down with something, something stressed her today and she’s needing more soothing, calming, and so we’ll provide it. Now with that, one of the things in, you know, I would say to her, Jane, I will stay. I will help you. You need to lay down. Sometimes our presence is actually too stimulating. And again, I’m not going to scare a child. Dr. Mary: 49:47 I’m not going to isolate them. And so what I’ll do is say, okay, I’m gonna move my chair to the door so you can still see me and I’m still here and if you want me to be closer than you lie on your bed and we just wait for her to kind of calm and then lie on her bed and then we’ll come back. So she learns that her behavior, she can choose to have you closer, but you’re not abandoning her. You’re not going out of sight from her. Dr. Mary: 50:21 Does that make sense? Kathryn: 50:23 Yeah. So that’s a good suggestion. Thank you. Dr. Mary: 50:26 And I’d like to as we close one is to affirm Kathryn, how well you know Jane than just your sensitivity to her, your awareness of her temperament. And how you have worked to meet her needs according to that temperament and it’s taken a lot of energy and it’s taken skill and educating yourself and I just want to recognize and commend you for that. Jen: 50:58 Go Kathryn! And thanks also for being willing to share your story with us. I know it’s not the easiest to air your laundry, is it on a podcast? But I’m grateful to you. Kathryn: 51:10 Well thank you so much. Jen: 51:10 Yeah, and also to Dr Mary for being willing to talk through these issues with us and really give us some concrete tools. Yes, specifically for the afterschool meltdown if that’s what you’re going through, but also, you know, don’t be afraid to extrapolate these to a higher level and saying, okay, how can I brainstorm things that work for me with the things that I’m struggling with, with my child. So thanks Dr Mary for doing that. Dr. Mary: 51:30 You’re welcome. Thank you for inviting me. I loved this..so many things like my child and me.